We are pleased you have chosen to learn more about us because we are excited about and believe in what we do. At Corcoran Family Dentistry we strive to deliver comfortable, modern dental care for your entire family in a relaxed yet professional setting. 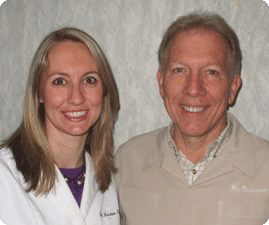 Dr. David Corcoran and his daughter Dr. Kristin Corcoran Tussing believe that open, honest communication is the most important aspect of the dental profession. We also feel that the more knowledge you have about your teeth, the healthier you will be. Although our website is still under construction, we would love to get the opportunity to meet you and take care of your dental needs. If you would like to schedule an appointment or find out more information, please call Sue in our office at 815-398-5610. We hope you will choose to become a member of our dental family.